Water Hyacinth (Eichhornia Crassipes) polluting the city lakes can now be cleaned up productively as it is being processed into organic green manure packed with nitrogen, potassium, phosphorous. Besides it contains 20% organic carbon, a boon for the Indian soil. It is the outcome of sincere efforts of Hyderabad based Khar Energy Optimizers and the Indian Institute of Chemical Technology (IICT). “IICT developed accelerator anaerobic bacteria is an excellent source of methane gas. Using the bacteria we are able to produce 100% chemical free manure from water hyacinth. This green coloured manure conditions the soil very well and nourishes it with required nutrients precisely NPK. As it contains 20% organic carbon it is the complete food in itself for the soil thus there is no need to use any other agri input such as pesticide or insecticide. When water hyacinth manure is used in the farmland the plants gain strength to resist pest and disease attack. It is used in limited quantity as compared to counterparts like chemical fertilizers, vermicompost etc. It is odour free and has less density,” affirms Mr. Raju L Kanchibhotla, CEO, Khar Energy Optimizers (KEO). KHAR Energy Optimisers is a startup started in May 2014 under MSME. Company began working with IICT, Hyderabad on the project to process waste and difficult to abolish water hyacinth into manure in May 2016. At present 100 ton green compost is ready for sale. It has been tested and certified for its unique features and benefits. It is sold under the brand name ‘Khar Ashirvaad’. “I had been observing water hyacinth casing city lakes for past 10 years. The green aquatic weed was left unattended so I started studying it closely. I found water hyacinth grows naturally in lakes having industrial waste and sewage deposits. It cleans the lakes but at the same time spoils the lake’s ecosystem and causes groundwater contamination. So far harsh chemicals were dumped in the lakes to get rid of water hyacinth but it ruined the lake’s ecosystem ruthlessly. On further study I found the plant is rich in proteins and can be converted into manure for farmlands. To convert waste into wealth, I teamed with Dr. A. Gangagni Rao, senior principal scientist, bioengineering and environmental sciences division, IICT. His department had developed anaerobic composting that produced methane useful for converting water hyacinth into organic manure,” describes Mr. Raju, the idea turned into successful product. IICT and KEO started their pilot project at Kapra lake (OoraCheruvu), located near Sainikpuri, north-east part of Greater Hyderabad. Out of 113 acre lake area 84 acre was covered with water hyacinth. “We removed the plant from the lake and separated leaves, stems and roots to learn its distinctive properties and composition. On analysis it was identified all the heavy metal and other materials are only found in the roots whereas leaves and stems contain highest amount of nematodes and proteins. Thereby we decided to take water hyacinth from lab to farmland by processing it into useful manure. We decomposed leaves and stems using accelerated anaerobic composting. Roots are decomposed separately to produce grade 2 manure,” he adds. KEO received affirmative response from Greater Hyderabad Municipal Cooperation to clean up Kapra Lake. It is an extremely challenging task to remove and dispose-off water hyacinth from the lakes! In addition, the entire process to make manure from water hyacinth is highly labour intensive. However, KEO successfully did it! “We brought labour from coastal area, took them to the lake by ship, pushed the plants to the shore and removed it from the lake. Next leaves, stems and roots are separated manually as there is no other way to do it. The leaves and stems are cut into tiny pieces. To process it further we made pits on the land within the lake premises and poured 90 buckets of chopped water hyacinth leaves and stems, 8 buckets cow dung and 2 buckets anaerobic bacteria. Crushed it all in layers and covered the pits with the lid and sealed it with a paste to ensure the methane gas produced by the bacteria gets trapped inside the pits,” Mr. Raju elucidates the process. Within 30 days under 35-40 degree Celsius temperature the compost is ready in the pits. The semi-solid consistency compost is removed from pits and dried on tarpau-lins. It is then pulverized to make into powder form and packed with proper labeling. “So far from Kapra lake we are able to produce 150-200 ton/month. Every month 1200 ton water hyacinth is removed from the lake out of which 6000 ton is the roots. Roots are also composted separately and made into grade 2 manure. It is available in huge quantity,” he shares. Khar Ashirvaad manure is available in two variants, Grade 1 (produced from leaves and stems) and Grade 2 (roots). The first variety is suitable for horticulture while second variety is apt for floriculture and forestry (non-edible trees). Bother varieties are priced reasonably. “We have launched the manure this month, June 2018 for commercial sales to the farmers,” informs Mr. Raju. Next project of KEO is to develop the technology to convert carbon dioxide in the air-conditioned spaces into oxygen through artificial photosynthesis. “Good air, good water and good food are the needs of the country. We will be always working on developing solutions for the same,” he asserts. 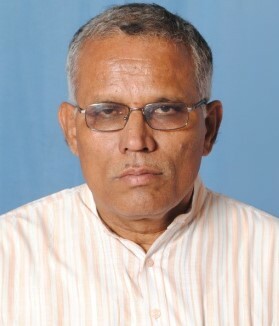 Mr. Raju L Kanchibhotla was an academician for 23 years. He became an entrepreneur in the year 2000 with a software company promoting E Education. In 2010 he established Khar Energy Optimizers to manufacture LED Lights and energy management solutions. In this course he started working on optimizing agriculture based on Wealth out of Waste (WoW) and developed manure from water hyacinth.